The Department of Mechanical Engineering is pleased to announce that University System of Maryland Regents Professor and Glenn L. Martin Institute Professor of Engineering C. D. (Dan) Mote, Jr. will be honored with the 2011 American Society of Mechanical Engineers (ASME) Medal. Mote will receive the ASME Medal at the 2011 ASME International Mechanical Engineering Congress and Exposition (IMECE)?a global conference that addresses technical challenges, research updates and breakthrough innovations that are shaping the future of engineering?this November in Denver, Colorado. The ASME Medal, the highest honor bestowed by ASME, is being awarded to Mote for his creation of a comprehensive theory of the dynamics of flexible moving structures?such as bands and spinning discs, with extensive engineering applications to circular and band saws?and his remarkable leadership at two major universities, the University of Maryland and the University of California, Berkeley. 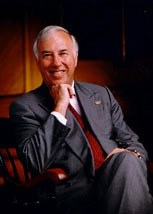 ME Research Professor and 2000 ASME Medal recipient Dr. Arthur E. Bergles spoke fondly of the 2011 ASME Medal recipient: ?It is entirely fitting that Dr. Mote be recognized with this award.? He added that ? [Mote] is an outstanding mechanical engineering educator and researcher who has made seminal contributions to applied mechanics.? Just a few months prior to receiving the ASME Medal, Mote delivered a keynote lecture on "The 21st Century Global Innovation Environment" at the 23rd Biennial Conference on Mechanical Vibration and Noise. The 23rd Biennial Conference on Mechanical Vibration and Noise was a part of the 2011 ASME International Design Engineering Technical Conferences (IDETC) and the Computers and Information in Engineering Conference (CIE), which took place August 28-31 in Washington, D.C. Mote?s keynote was a prime event at this conference, which united representatives from a variety of engineering disciplines in industry and academia to discuss the latest research and challenges in vibration and noise technology.
? [Mote] is an outstanding mechanical engineering educator and researcher who has made seminal contributions to applied mechanics. ?